Making a record is an emotional process and if you decide to work with me I will try to bring your ideas, hopes and dreams to fruition. Bringing the production of the songs to their fullest potential is the ultimate goal. Proper recording, mixing and mastering can effectively manipulate the listeners emotions and focus so they will want to sing along, dance, tap their feet, pump there fist, cry, laugh, play air guitar and even get goose bumps. If you’re fond of a particular artist or CD bring it in so I can use it as a reference. You might like the sound of the reverb on the vocals, the presence of the acoustic guitar, the grunge of the electric, the thump of the kick drum or the fullness of the piano. After the recording I’ll usually mix a couple of songs to what I think you want and /or what I think sounds best as a starting point and invite you back for feedback. Thus begins the collaborative process of manipulating the faders and processors to find the feel and sound you’re after. We will try different settings and a/b them, then burn a couple of variations to a CD you can try out in your car or home system. You’ll tell me what you like, I’ll mix the remaining songs and you’ll come back to give more suggestions or final approval. If I can’t get the sound or style your after I can hand the raw recorded tracks over to you to get mixed by someone else. If you’re happy with the production I can give you the files to take to a mastering house or you can let me perform this service which involves making minor adjustments to the stereo track with equalizers and compressors and bringing up the volume to -3db with the Waves L3. If I did my job correctly as a mixer there should be about 10db’s of dynamic range, which is the difference between the softest and loudest sound, maybe more for solo instruments and less for rock. Your next level of involvement would be to determine the track order along with the time and fades between songs all of which I can make suggestions. I would then give you a DDP (Disc Prescription Protocol) you could take to a replication house. If you’re not interested in more than 100 or so CD’s I can make these with labels and inserts and wrap them in plastic. I can also give you a Wave, AIff, and or MP-3 file you can use on your web site and upload the songs to Nimbit or Sound Cloud. I recorded Scott Grube playing piano, mixed, mastered and delivered him 100 CD cases with his picture on the back and artwork he brought in for the cover. On the back of the CD and insert Scott gave special thanks to the special people in his life and wrote a touching personal statement about his musical influences and about the artistry of playing an instrument which he gives out as gifts or sells when he performs. I know he’s glad to have these which I think anyone whose put so much time, energy, and commitment to learning an instrument; even if it’s for posterity’s sake and not intended to sell. When I do something it’s usually family and a few close friends I’m most interested in sharing with. As long as you don’t have more than 100 you should be covered. Below is a description of the recording studio and equipment I use in recording. Each piece in the audio chain can either diminish or enhance the audio. Low quality equipment adds unwanted noise to the signal while high end equipment keeps the audio clean and enhances it to make it sound fuller, smoother, richer and considerably more interesting and pleasing to listen to. 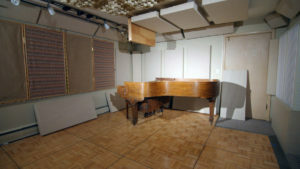 The recording room was designed to obtain a balanced frequency response. This was done by placing three dozen Owens and Corning 703 fiberglass panels around the room to absorb problematic sound wave reflections. The six diffusers made by Real Traps reflect the sound and add a nice sense of spaciousness. Joe Tessone, owner of Mystery Street Recording Studios, said it was one of the best sounding rooms he’s been in. Many recording rooms double as lounges or are used for storage but I keep mine empty except for the artist and the instrument. I don’t want anything in the room interfering with the sonic characteristics of the acoustic treatments or vibrational sounds being picked up while recording. 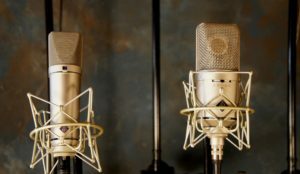 Medium to close microphone milking has become standard practice and audio engineers have relied on processors (either the plugin or outboard type) to create ambience, reverb and space. The Bricasti Reverb Processor does this better than anything developed thus far and every major studio is buying one. Engineers across the world describe it as a major breakthrough and say it adds life and presence to instruments like nothing else. When I compare this to a Waves reverb plugin, which I thought sounded good, it sounds flat , scratchy and two dimensional compared to the Bricasti; which puts the instrument or voice in a room with a sense there is space behind, in front and to the sides or three dimensional. Reverb is a selective effect, not something always wanted but this box has presence settings which when used one won’t even notice except when taken off. I use these presence settings on most of the tracks not requiring reverb. A Limiter or compressor is a piece of gear which raises the volume of the quieter parts while reducing the levels of the loudest. This is needed when several instruments are playing together so one doesn’t drown out the other. 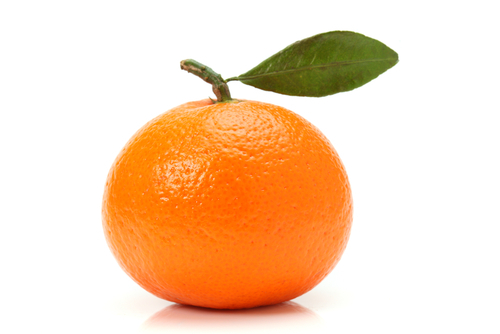 Some manufacturer’s brands do this cleanly; others impart a color or warmness to the signal. 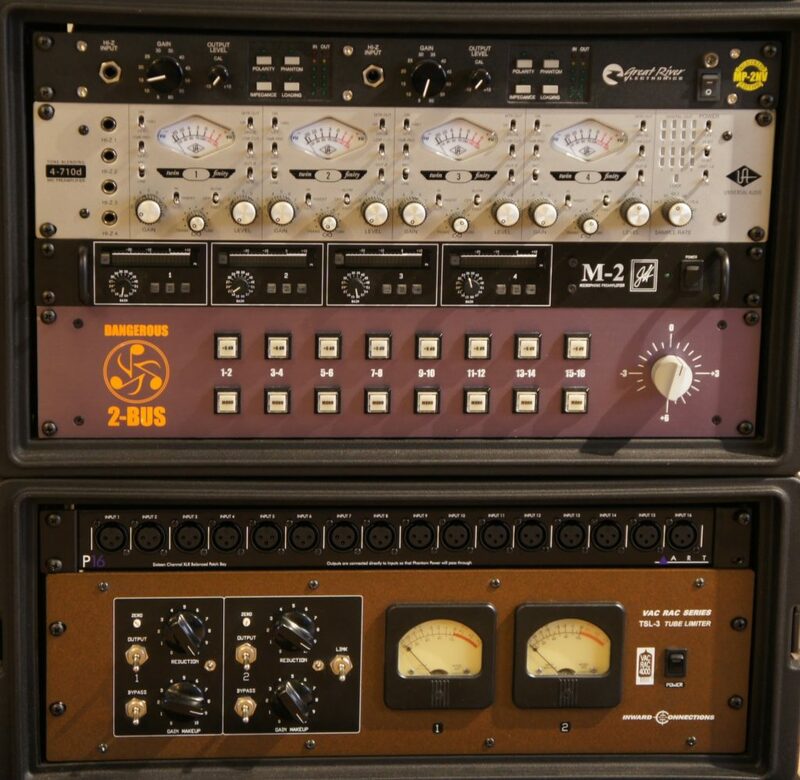 The Inward Connections TSL -4 tube compressors does the later. Audio engineers call it stunning, amazing, brilliant, shockingly great and a mixing must have. Chris Lord Algee, a very famous and influential mixer who has almost every piece of analogue gear available, uses it so often on his vocals and on so many different instruments all of his music has been criticized of sounding the same. If it’s fine with him it’s fine with me. What this box does is make the track sound larger than life. The UBK fatso is a very complex signal processor that does many things and took me a long time to master. It is a compressor like the one described above and can change the sound of any instrument put thru it. Need to add pop or thack to a snare or tom or make something sound hugh or pillowy this box can do it. It also has setting that adds harmonics, saturation and warmth to sound; something desirable when recording digitally. Equalization enhances the sound of a mix or its tone. One can increase or decrease the base or treble which you’re familiar with if you’ve ever adjusted your home or car stereo. Mix engineers can make these adjustments using either plugins or analog processors but most prefer the analog especially at the higher ends of the audible frequency spectrum where adding air to the audio is desirable. Digital eq’s can’t do this very well because they produce nonlinear distortion and have phase response and accuracy problems. The Crane Song IBIS is considered one of the premiere analog eq’s and is used in many of the world’s renowned recording, mixing and mastering facilities. Dave Hill designed this 4 band handmade eq to be extremely clear and open but at the same time warm. Even extreme amounts of this eq sound good, which give it immense sculpting power. The unit adds a sheen and quality that enhances the signal. This unit also has a coloring option that lowers the third harmonic that can be applied to select frequencies or to the full bandwidth adding a flattering grit to bass tracks, electric guitar and vocal. There is no such thing as the best eq but after doing considerable research I decided to buy the IBIS because in its natural state it’s clear and can be colored to make for a very versatile and interesting piece of equipment. Digital audio work stations or the computer have taken over as the main platform for recording and mixing audio. 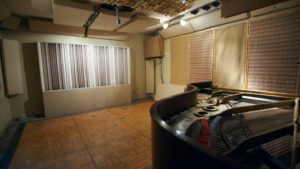 Before that it was done on a mixing counsel with mechanical faders, some with as many as 100 and a room’s width wide costing into the triple digits. The problem with the digital audio work stations compared to the mixing counsel is eventually all tracks have to be combined into two; the right and left, and computers don’t combine audio well. It’s done mathematically and the problems include propagation of rounding errors, numeric overload and bit truncation. With the dangerous 2-bus your audio is combined mechanically instead of mathematically which produces greater extended high and low end, wider mixes, more punch and the most importantly more depth. 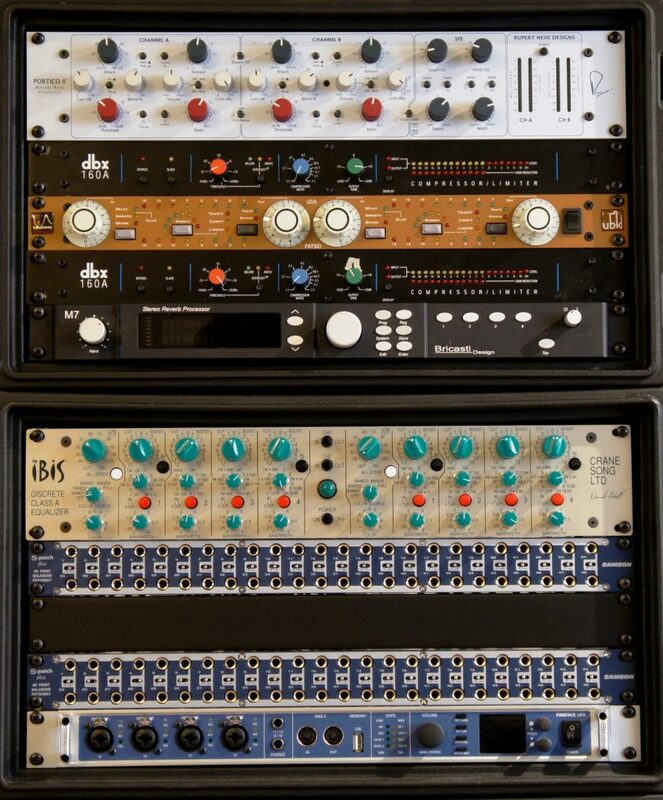 Neve products have been a staple in the recording business thru out the world since the early 60’s. This piece of gear has the largest output transformers he has ever used in a line level device. This unit adds polish to the tracks by giving the audio a fuller, brilliant, lifelike, and natural sound. It also has a processor that spreads the stereo field some describe as glorious. How only 4 recorded instruments can create a wall of sound is by putting them thru processors like this and the ones listed above. Just listen to the Beatles. 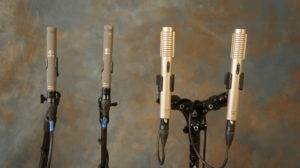 All the microphones I use are high end with the large condenser Neumann M149 and 87i being recording standards. The M149 sounds great on almost anything put in front of it. The U87i is the most famous mic in all of music history. The Blue Cactus has a warm vintage sound that is upfront and clear with a tight bottom end. The Kiwi is solid state designed for vocals which sounds natural, transparent and is smooth as silk. Since a vocal mic has to match the singers voice character and style all four of these large condenser mics should -be lined up and sung thru to determine which the best fit is. The Schoeps CM6 small diaphragm mics are amazing on acoustic guitar, ride and the hi-hat. 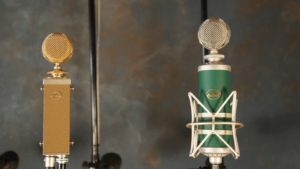 The Royer R122 Microphones are ribbon mics and sound terrific on kick drum, drum overheads, guitar amps and wind instruments. The Audio Technica 4051 have been known for years to be the best mics to record piano and I always throw them up along with the M149 on the base strings and the Blue Cactus on treble and blend them. The AKG 414’s are all purpose mics but I use them mostly on toms. The boutique mic preamps from John Hardy are considered the finest pre’s in the world built using the most expensive electronics that provides detail, accuracy and transparency. The Great River mic pre’s can be adjusted to impart some color and are good to add a rich character to the tone which is desirable for bass, electric guitar and vocal. The A/D converter takes an analogue signal and convert it to digital 0’s and 1’s that the computer can identify and out again to analogue. The one I use is made by RME which is considered one of the best. I have most the Waves digital plugins and several from Soundtoys and use these to obtain either some precision control over the eq and compression or for interesting effects. Steve Turnidge, who wrote the book Desktop Mastering, uses the Waves Linear EQ, C4 Multiband Parametric Processor and the L3 Ultramaximizer almost exclusively to master; this influenced me to do something similar when mixing or mastering. The L-3, with look ahead accuracy, has surpassed any analogue device and is used throughout the recording world to increase volume which allows recording at lower levels to help avoid clipping. These digital processors create their own unique sounds or are designed to emulate analogue hardware which they do for much cheaper. Are they as good as the analogue devices, not at all, especially for compression. I have two analogue dbx 160a compressors and also the plugin version and even though the plugin has the same sonic properties as the analogue the texture, resonance, and dynamics are missing. An exception to the debate of whether analogue gear is better than digital is classical music often sounds better when mixed with digital gear. These digital processors are chosen because they are transparent and provide processing with very little distortion.